First really rainy day in ages. Boo and I were on a mission, despite the rain, to go to Purl Soho (www.purlsoho.com) to pick up the yarn for my next project – a commission for two sweaters for two four year olds. Of course, it’s out of stock and I had to order it from the website, but it is always wonderful going into Purl. Bertie really enjoys going over the Manhattan Bridge, so we took the D and then, upon returning to the Slope, I bumped into a fellow kiwi that I haven’t seen for ages. Always great to bump into kiwis – I seem to know less of them than before – New York is a place to people seem to move on from; usually without much warning. I have also managed to finally finish the Brooklyn Map cushion today. Great as it’s my mother’s birthday tomorrow (happy birthday Mum!!) and I can send it off to her (it will be late, but that’s how it is when you have three kids). I now only have Ms. McB’s cushion to finish and B’s quilt. I have cut out some more leaves and will start pinning them tonight. Still undecided as to how to do the back. It’s so great having a creative, fluid process with these projects, as I enjoy mulling over all the different options – so many posibilities. I can’t believe the summer is almost over. R and M go back to school on Thursday. Two and a half months have flown by. We have recently returned from a wonderful vacation in London. Such a fun city. Along with the usual tourist things (London Eye, Buckingham Palace) we went to some of our old haunts; Providores, Marylebone High Street, the Kings Road. The shopping was incredible. John Lewis is a wonderful department store with the most fantastic haberdashery. We also went to the V & A (Victoria and Albert museum) to look at the dresses (wonderful) and Asian wing. The fabrics are dazzling and inspiring. I brought R a replica Princess Diana/Dutchess Catherine wedding ring. It’s really lovely and R is delighted with it. 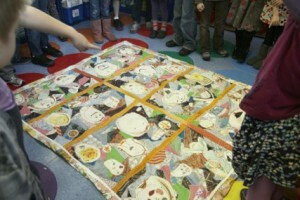 I have had the great pleasure in making a quilt with Ruby’s class for the PS154 Winter Art Fair. Having never made a quilt before, I wasn’t prepared for how much I would fall in love with it. It was a truly collaborative project with the kids helping with the design, layout and contributing the fabric which made it. To watch a wee movie of the project click here; Ruby’s class quilt Dec 2011. I also helped make hot air balloons for the Pre-K class contribution to the Art Fair. Maxi insisted that we win it in the auction, which luckly we did. He has since we brought it home, played with it, putting in his pigs and the farmer that he made last week in class. Absolutely delightful. This week I’m making a scarf for Maxi and will try and finish Ruby’s beret (I’m hoping I have enough wool).